Segments are a feature in Google AdWords, almost hidden under the main navigation, alongside some other interesting buttons. While this button doesn’t seem particularly outstanding, looks can be deceiving. It holds a wealth of information about your campaigns that can help you make more informed decisions. Segments allow advertisers to dig deeper into their performance metrics. An advertiser can select which type of drilled-down criteria they are looking for and Google will provide deeper segmentation and insights. The Segment feature is available for just about every campaign element – campaign, ad group, keyword, ads, ad extensions, audiences. Just below the main navigation, an advertiser will see the segment button across almost every tab. When you click on the Segment button, you’ll see a drop-down of the available segments. These are the options available to you when drilling down into performance data. 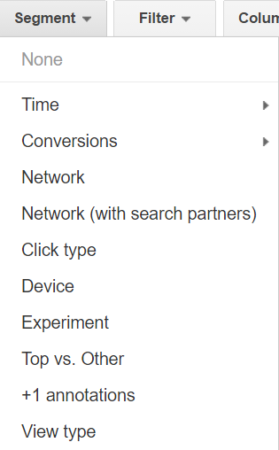 The Time and Conversion selections have additional arrows. 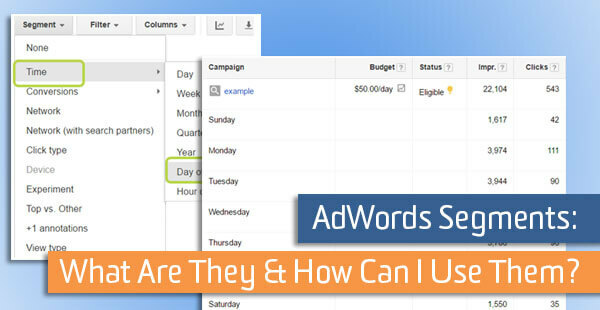 Hovering over the arrows allows an advertiser to select specific timeframes or conversion criteria. So you have the definition of segments, you know where they are located and what the segment options are but now, let’s discuss how they work. When you select a segment, Google will expand your dashboard (table of performance metrics) and insert the segmentation criteria. 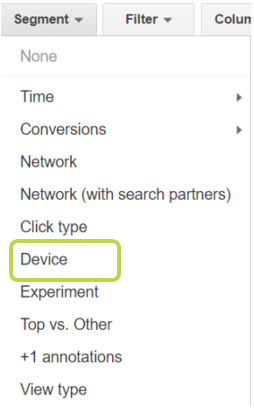 For example, if you choose to segment by Device, Google will insert new rows under each campaign (or another element such as ad group or keyword depending on which tab you’re on) that provides reporting by device. 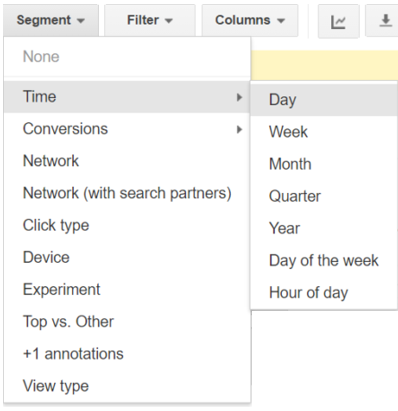 If you select Time > Month, Google will provide reporting by month. By digging deeper into performance by the selected segment criteria, advertisers can make better decisions. 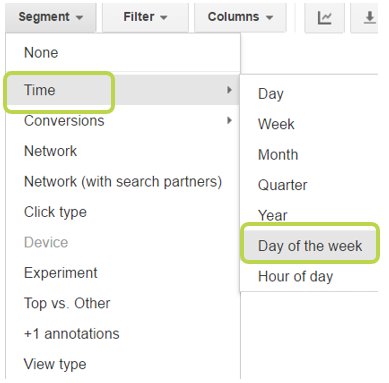 If you understand how your campaigns or keyword perform across different devices, during different months, during different times of the day, days of the week, based on the network, based on distinct conversion events, across Google search vs. search partners, you can make more informed account optimizations. Let’s now go into detail on some of the important segments. Segmenting by device allows us to see the performance breakdown by computer, mobile and tablet. If mobile devices drive efficient performance, perhaps we increase the mobile bid adjustment (that means we tell Google that we’re willing to pay more for a mobile click). If mobile devices drive less efficient performance compared to computer and tablet – or mobile drives inefficient performance compared to our account goals, we can implement a negative bid adjustment on mobile devices. The segment by time selection allows us to see performance data by day, week, month, quarter, year, day of the week or hour of the day. This segment also gives us useful information to make more informed decisions! Once we analyze the data, we can use the learnings to influence our ad scheduling strategy – or when we activate ads, pause ads, increase bids or decreases bids throughout the day and week. If there are hours of the day that produce strong results, perhaps we implement bid increases. If there are days of the week that are overall more inefficient, perhaps we implement bid decreases or pause the ads during those timeframes completely. Segment by conversion is important for advertisers who have conversion tracking and conversion goals. When viewing the conversion metrics on a dashboard, AdWords will aggregate all conversions and provide you with a total (i.e. your campaign generated 45 total conversions). 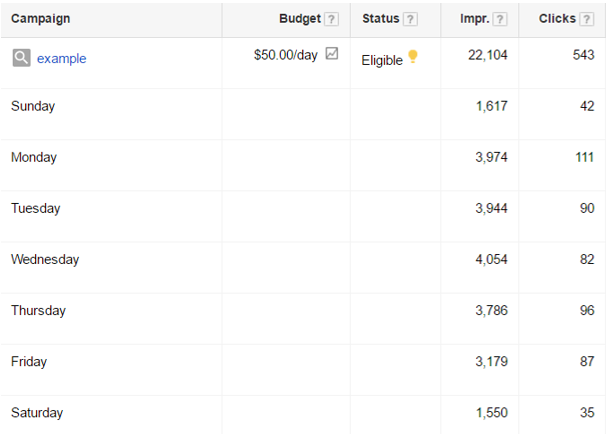 With the segment by conversion feature, you can see the breakout by conversions if you have more than one in the AdWords system (i.e. orders placed generated 30 total conversions, email newsletter sign-ups generated 15). This is a very useful feature! It can help you understand which campaigns, ad groups, keywords or audiences are generating each type of conversion. The segment by conversion feature has two options; segment by conversion name or conversion category. 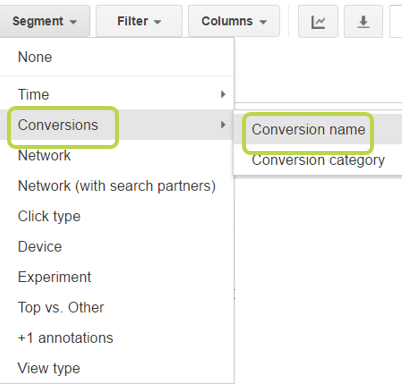 If you select conversion name, each individual conversion will show up on your dashboard based on the naming convention input when the conversion was created. If you select conversion category, you will see the total rollup by category, which was also input when the conversion was created (“category” is a drop-down selection available to you when creating a conversion). Try out the segments above – and then look through the others! What does the segment data tell you? Are there useful changes that you can make?